Our Delta commercial series motion activated electric bathroom faucet is hands free! 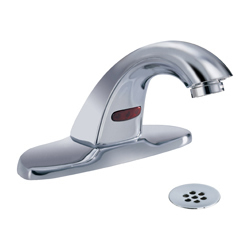 The ADA compliant bathroom faucet runs on 4 "AA" batteries with no external adjustments required. Chrome finish. Includes mixing valve. Complies with ASME A112.18.1, CSA B125. ADA compliant to ICC/ANSI A117.1.